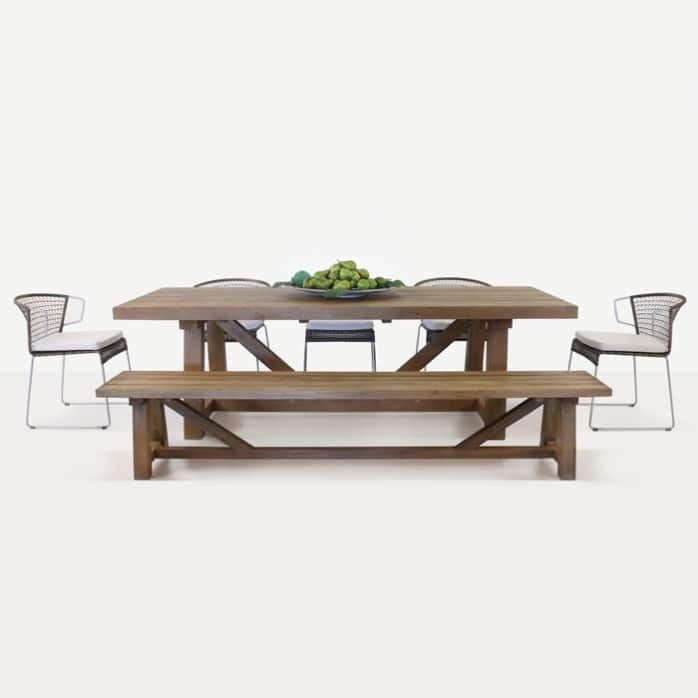 Wanting to go modern, sleek, rustic and contemporary… all in the one dining set? Then this combination will leave you inspired! We begin with the chunky, sophisticated and distinguished 250cm Trestle Table, built out of hardy Reclaimed Teak into huge slabs of gorgeous boards that frame a tabletop and incredible trestle base. Impressive doesn’t even begin to do this piece justice! The exquisite warm colour is stained lightly throughout the wood. And if that wasn’t enough to tickle you, check out the matching bench! 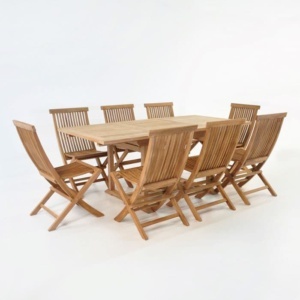 Wanting to go modern, sleek, rustic and contemporary… all in the one dining set? Then this combination will leave you inspired! 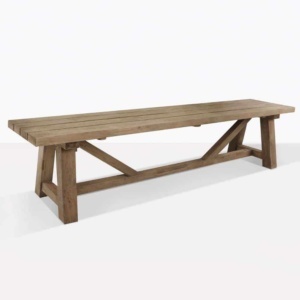 We begin with the chunky, sophisticated and distinguished 250cm Trestle Table, built out of hardy Reclaimed Teak into huge slabs of gorgeous boards that frame a tabletop and incredible trestle base. Impressive doesn’t even begin to do this piece justice! The exquisite warm colour is stained lightly throughout the wood. And if that wasn’t enough to tickle you, check out the matching bench! Sophia Chairs have become a staple piece here at Design Warehouse, our customers buy them for inside or out, in an office, or in the garden – you name it, the Sophia Chairs look good anywhere! The selling point is the slender lines on an ultimately robust frame of steel with strong through-dyed wicker configured into a delicate diamond pattern and topped off with a Sunbrella® cushion to keep you in comfort all year round. The Sophia Dining Collection encourages you to have the best of both worlds, the practicality of strong, all weather materials with the chic quality of indoor furniture – you’ll impress visitors and be thrilled with the impact this attractive set has on your space. Don’t be bashful about trying it indoors as well! We love the look of this magnificent set within a farmhouse kitchen or a contemporary dining room – just the right amount of contrast. If you’re thinking outdoors – envisage this: You’re out on the stone pavers with a market umbrella overhead and a glass of wine in hand as you sit back and relax with friends around this splendid table, whipping your shoes off and creating a relaxed atmosphere is what it is all about. The Sophia Dining Collection will put you in good stead for many a long lunch or dinner that goes well into the evening. Call us now to discuss size options and add on ideas!